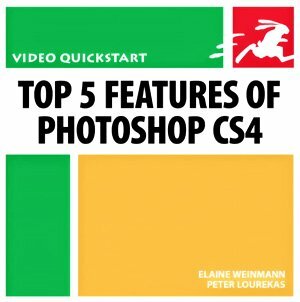 If you are like me, you upgraded to Photoshop CS4 and never looked at the manual. ( It could have something to do with Adobe NOT providing print manuals anymore.) Instead, you probably have been reading blogs and tutorials to learn about the new features. Each of these features are covered in detail. For example, did you know that you can copy a selection from one window to another by holding the selection over the tab of the second window? Photoshop will swap open windows and allow you to place the selection in the second window. Or, did you know that you can use the new On-Image Tool to find a color value on a curve and create a Adjustment Point at that exact point? Pretty cool! I am a big fan of the Visual QuickStart series and this video fits in perfectly. I hope they do more! But, if you really want to get the best deal, create a FREE account with Peachpit for member discounts and free shipping. Be sure to sign-up for Peachpit’s email newsletter (they send out coupons!) The member discounts, coupons and free shipping make buying direct from Peachpit a real saving over Amazon.